With 114 wild wolves in the U.S. and fewer than 25 in Mexico, Mexican gray wolves, or lobos, are the most endangered gray wolves in the world. The wild wolves aren’t just facing a dip in their numbers; they are also facing a genetic diversity crisis – a recipe for extinction. 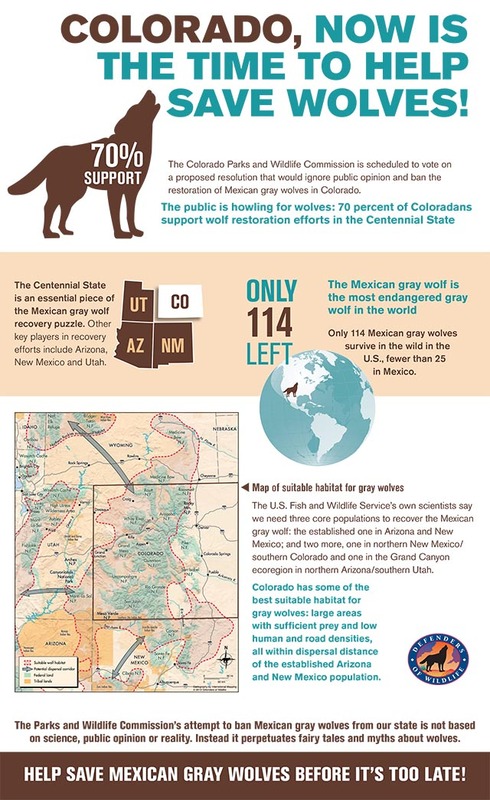 In order to save our lobos, officials from the Four Corner States need to allow recovery efforts north of Interstate 40, in the Grand Canyon ecoregion and in northern New Mexico/southern Colorado. According to the best available science, wolves can roam there and establish sustainable, healthy populations in suitable habitat. If science gives us the solutions to save our endangered species from extinction, we owe it to our kids and grandkids to use them.